At points this weekend, as it will all year, logic abandoned sport. A non-league team knocked a Premier League club out of the FA Cup. The champions of Europe went behind - twice - against League One small-fry. At other times, in other contests, that logic - the rational assumption that the superior will always beat the valiant subordinate - stood firm, despite all the emotion and industry aimed at it. Six-time Grand Slam champion Boris Becker: "If we see the whole match together, the better man won. Murray had a few break chances, but once Djokovic won that second set he just started to find another level. Djokovic was really the aggressor, he took more risks and more chances. As the match went on Djokovic did the running and Murray didn't." Former British number one John Lloyd: "It was a superb performance from both players. If Murray had found a way to get that second set we might have been saying something different. Once it was 1-1, Djokovic went up another level. Djokovic has that extra gear. It looked like he could play for another five hours. Murray seemed to be struggling towards the end. I'm sure the feet were sore, but that's no excuse. 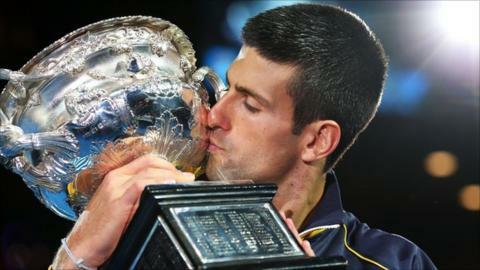 Djokovic is just magnificent, absolutely magnificent." Novak Djokovic's 6-7 (2-7) 7-6 (7-3) 6-3 6-2 win over Andy Murray in the final of the Australian Open was certainly tight. At times there was so little between the two players that only a feather could come between them. It was also an accurate reflection of the great friends and rivals' performance and ability. Murray has one Grand Slam title to his name. Djokovic now has six, the same as Boris Becker and Stefan Edberg. And therein lies both your outcome and explanation. The margin between the two is undoubtedly finer than it has ever been, not only in terms of skill but also style. So physically tuned are Djokovic and Murray, so relentless in defence - "human back-boards", as John Lloyd refers to them - that their contests can only ever be close. We were almost three hours in before we witnessed the first break of serve. British partisans and sporting romantics will point to the moment, at 2-2 in the second set tie-break and Murray a set up and on second serve, when that single white feather floated slowly down from the rafters and stopped the Scot in his stance. At first there was amusement - bird stopped play - and then applause, as Murray caught the feather and attempted, somewhat comically, to throw it away. The double-fault that followed was no laughing matter. Djokovic, for the first time, had his Serbian beak in front. Murray would win just one more point in the tie-break, and would never again re-establish superiority. There was a second external interruption that others may wish to highlight, when an errant shout from the boozy back-seats with Murray serving at 30-40 and 3-5 in the fourth set led to another Djokovic point. Neither, in truth, were as pivotal as the three break points Murray failed to take in the first game of the second set, and neither was critical in the overall conclusion. Djokovic prevailed because he was capable, when the spirited Murray was not, of raising his game to a yet more rarefied level. He had held the whip hand throughout the first set, setting up five break points to his opponent's none only to see the tie-break slip away to Murray's most inspired spell in the match. When Murray's first miniscule dip appeared in that second tie-break, he pounced. In a flatter third set he turned the vice until tiny fault-lines widened into serious cracks; as Murray's movement slowed, he stepped up the aggression and won eight games in nine as the match moved into its fourth hour. The semi-final between these two in Melbourne a year ago lasted four hours and 50 minutes. Their US Open epic went four minutes longer. Djokovic was able to seal this one in an hour and 10 minutes shy of that because he never let his superiority slip. If there was little between the two in some stats - the Serb landed 63% of his first serves, the Scot 60% - and an advantage to Murray in others (the champion made 61 unforced errors to the runner-up's 46) then Djokovic's belligerence took its toll in a match notable for the violence both men dished out to the ball. He hit 47 winners to Murray's 29. He came to the net 41 times, and won the point on 35 of them (Murray came in only 15 times and succeeded on just over half). And while Murray could not make a single break point count, Djokovic converted three. In defeat there were none of the tears from Murray that marked his previous Grand Slam final loss, when Roger Federer at Wimbledon similarly came from a set down to beat him in four. Neither did he blame the blisters which covered his feet nor the tight hamstring that appeared to slow him. This was his third Slam final in a row, with an Olympic gold laced in between. More will surely follow. So too should victories. After his first four finals there appeared to be a glass ceiling between him and the mighty triumvirate of Djokovic, Federer and Nadal up above. In the last six months he has broken through it. Over the next two years he can keep ascending. In taking on three of the finest players in history and not just matching them but vanquishing them, repeatedly, Murray faces one of the great challenges in British sport. His intimidating physical strength and upgraded mental fortitude will be essential in the battle. So too is finding an answer to Djokovic's current advantage. Murray is certainly less reactive on court than he was before coach Ivan Lendl got to work. He may have to be more aggressive yet, at least at decisive junctures, if he is to match the evolution of the best player in the world. "This level is something that I thought he was well capable of for a long time now, and I've watched him fight to get past his passiveness," says Andre Agassi, four-time Australian Open champion and the man who presented Djokovic with the Norman Brookes trophy on Sunday night. "I saw a guy who was so good defensively, it almost was his liability, because he was quick to rely on it. He found himself not stepping up against the best, arguably, of all time, which happened to be in his generation. "I like what he's learned and I like the standard that he's imposed on himself to go out there and take it. Last year he obviously did that with the Olympics and the US Open, and I think he now recognises what he needs to do. That clarity will make him much more effective and give him a much better chance to do it again and again. "He has the unfortunate case of being in an unbelievable generation, but he's proven that he has the ability to win, and that's right because the guy has serious game. If he was in my generation, you'd be asking me 'When do you think you're going to win a Slam?'" When Murray has recovered from this defeat, he will reflect that much good has come of the past fortnight. Regardless of what the ATP rankings might say, it is now his rivalry with Djokovic that is the primary one in the men's game. Federer will win again, and Nadal may pull off a medical miracle and overcome the tendinitis that has wrecked his knees to get back to his wondrous peak. But for the year that lies ahead, and perhaps for several more, it is Murray and Djokovic who will tantalise, treat and torment in equal measure. For the champion, Melbourne's blue plexicushion courts haves become the ultimate second home. In victory on Sunday he did something that even Agassi found beyond him and won his third Aussie Open title on the bounce; while this was his first Grand Slam win in four attempts, he is now the dominant player in arguably the dominant age. Agassi, ever the sage, has no doubts. "When he's on defence he can actually win the point with one shot. That's an evolution of the game, and something tells me it's not going to stop here. "History would prove that it's never going to stop. So every five years it seems to click up a different level. It's a remarkable era."